A Golden Retriever grooming routine is an important part of caring for your dog. Cats are the ultimate narcissists. You can tell this because of all the time they spend on personal grooming. Dogs aren’t like this. A dog’s idea of personal grooming is to roll on a dead fish. A Golden Retriever will pose some serious considerations when it comes to grooming! It is essential to establish a puppy grooming routine which will continue throughout your Goldens life. Golden Retriever grooming is just as vital as the correct diet for a healthy coat and a healthy dog. According to one study, a single genetic line characterizes the differences of Labradors and Golden Retriever dogs. 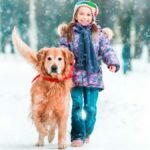 One of those characteristics is the longer, double coat of the Golden Retriever which is why the coat of this furry companion needs a different routine from other dogs. hGolden Retriever grooming is required regularly as they have double coats with very heavy feathering, which means….MORE GROOMING! The adult Goldens coat can grow from 1 – 3 inches long, with an average rate of 0.5 – 1.5 inches monthly. Their hair should be trimmed at least 0.5 – 1 inch every month. Learning how to groom a Golden Retriever should start as soon as your puppy is born, to socialize them to being touched and brushed. It’s a great time to bond with puppies! It is highly recommended to brush their coat at least 3 to 5 times a week to assist with keeping the coat clean and preventing tangling and matting, it can be problematic if unwanted bacteria lodge in and cause infection. Daily Golden Retriever grooming should take no more than 10 to 15 minutes. 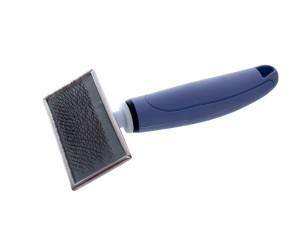 The constant brushing will also lessen hair shedding although it is unavoidable. The adult Golden Retriever dog sheds heavily twice a year and can be a real problem for pet parents. There are however steps you can take to reduce excessive Golden retriever shedding. The basic tools required are (in order top to bottom): (1) pin brush, (2) undercoat rake, (3) bristle brush and (4) slicker brush (to remove matts). The pin brush should be used for the head, chest, belly, legs, tail and feathering whilst the rake works well for the back and sides. Rakes are brushes designed to penetrate into a dog’s thick coat and remove tangles and dead undercoat near the dog’s skin. Bristle brushes can also be used but on longer adult coats, you will need widely spaced, longer and stiffer bristles. Matts not removed with the fine wire bristles of the slicker brush can be taken care of by applying a conditioner for dogs before brushing or by trimming with scissors/ shears and a comb. Slide a comb between the matt and the skin before trimming to prevent cutting your dog. When grooming a Golden Retriever, check the condition of the skin, particularly for allergies, sores, ticks and fleas. Don’t forget to apply a flea and tick preventative as per the instructions. When a Goldens nails are too long, you will hear them scrape when the dog walks on hard surfaces. The claws should not protrude over the pad and should not touch the ground when standing. A puppy’s nails grow very fast (due to their high protein diet) and need to be trimmed at least every 2 to 3 weeks using a nail clipper to avoid nail splitting and cracking. If you trim your dog’s nails regularly, your dog becomes used to it and won’t mind. During Golden Retriever grooming be mindful that only 3 to 5mm of the nail should be trimmed to avoid cutting the quick of the nail. Most Goldens have white or light brown toenails so you can see the pink ‘quick’. The quick is the blood vessels and nerves that supply the nail and cutting the quick is a big NO! Don’t forget the dew claws – these are located slightly higher up on the inner leg. Purchase a specially made cutter for dog’s nails to assist you with your Golden Retriever grooming routine. There are several styles of nail trimmer available. Plier type nail cutters with a scissor action suit larger dog breeds. Choose a good quality claw cutter with sharp stainless steel blades and a comfortable handle with a good grip. After a rainy walk, clean your dog’s feet in lukewarm water with antiseptic solution, dry carefully and apply Vaseline for cracked pads or just anti fungus power. Checking and cleaning your Goldens ears should be included in your Golden Retriever grooming routine since they produce more ear wax than other dog breeds to avoid infection. Make sure there’s no redness, discharge or smell. If there is, do not clean and make a vet appointment. To clean healthy ears use a solution specially made for cleaning a dog’s ears and follow the instructions to put a little bit into one of the ears. Gently massage the solution around inside the ear. Use a cotton ball or piece of gauze to wipe any dirt out of the ear. Never use a Q-Tip! It can injure your dog’s ear canal. It is virtually impossible however to injure the ear drum as the ear canal has a sharp 90 degree turn before it reaches the ear drum. Repeat for the other ear using a fresh piece of gauze or cotton ball. Both Golden Retriever pups and adults are prone to ear infections as they have floppy ears and love to swim. Checking the inside of their ears during grooming will help to prevent infection. The teeth of your dog will benefit from weekly cleaning. Use dog-specific products such as a finger brush – a hollow plastic tube that fits over your finger and has inbuilt bristles. The finger brush is easier to maneuver and prevents too much pressure being applied. Teeth cleaning can be a strange experience and you may have to slowly introduce this gradually to Golden Retriever pups. gYour dog needs to bath twice a month avoiding getting their ears wet as part of their Golden Retriever grooming routine. It is highly recommended to brush their coat before you bathe to reduce the amount of hair and tangles. 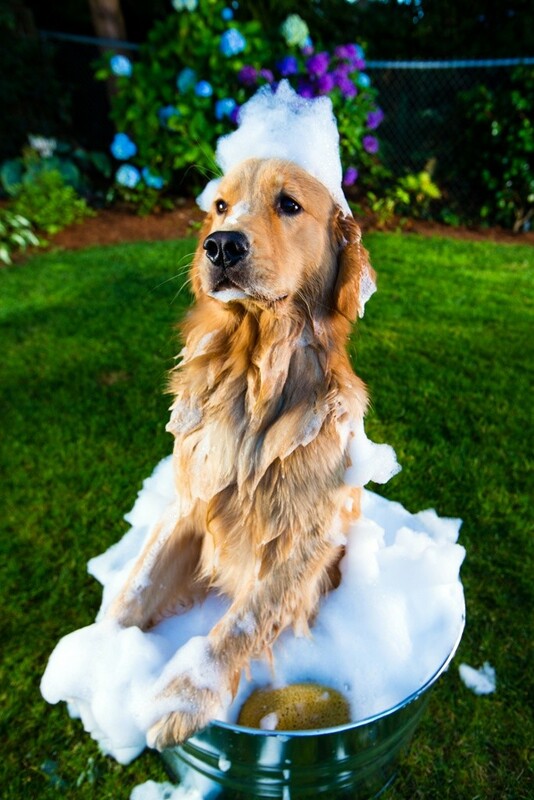 Bathing and grooming a Golden Retriever will assist in the removal of loose hair, making the job of cleaning up after a coat drop a little easier. A quality dog shampoo should be used for washing and if skin reactions occur, try a different product as there are many to choose on the market. Rinse off the shampoo carefully. Your dog will also require rinsing after swimming in chlorinated or salt water to avoid skin irritations. It is important that Golden Retrievers are thoroughly dried after bathing, especially the ears and tail. 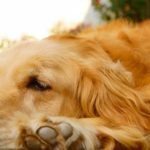 Goldens can get ‘limber tail’ from cold water at the base of the tail which can be very sore and his tail will just hang, too painful to wag. Vaccinations prevent serious disease and should start from the age of 6 weeks and continue up to the age of 5 with boosters thereafter every 3 years. You must make an appointment with your local vet to discuss a vaccination schedule. Golden Retriever insurance can help to cover these costs. 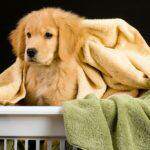 All Golden Retriever pups are born with worms and de-worming is an essential part of grooming your dog. De-worming can start from 2 weeks. You should discuss an appropriate deworming schedule with your vet. Heart worms are fatal and a monthly preventative is recommended. Learning how to groom your Golden Retriever will reap many rewards for both owners and pets in years to come. They are wonderful dogs that need the extra attention, love and care of every responsible owner. A Golden Retriever grooming routine helps you to bond with your dog and assists in keeping them healthy.